Thinking about buying a new PC this holiday season? If you're not, you should be. There has never been a better time to buy one. Laptops are thinner, lighter, faster, cheaper and way more interactive than ever before. Pair that with Microsoft's excellent new Windows 10 operating system, and you've got a compelling reason to upgrade. But laptops are just one of many PC offerings that will be stocked on store shelves this holiday season. 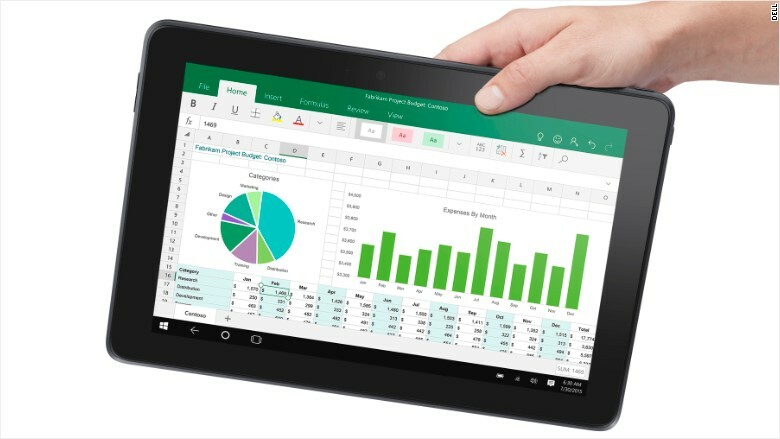 Tablets, two-in-one PC-tablet hybrids and even tiny "compute sticks" are all going to be showcased as well. And with some PCs with price tags as low as $150, there's something for everyone, at every price point. "This is the best lineup of devices we've ever had," said Terry Myerson, head of the Windows and Devices team at Microsoft (MSFT). "Compared to two-year old devices from any vendor, it's amazing how much better these devices are." The PC industry is certainly excited about this holiday season. It sure could use a boost: PC shipments fell by 11% last quarter, according to IDC. As smartphones become our primary computing devices, many people are satisfied extending the lifespan of their older PCs. And some who might have been in the market for a new PC during the past few years were scared off by Windows 8's kooky tile interface. But check out some of the PCs available now, and you'll probably be pleasantly surprised. "People going from old PCs to new PCs will see that they're half as thick, have better graphics and start up much faster," said Navin Shenoy head of Intel's (INTC) mobility client platforms. "They'll be amazed at how good they are." HP's (HPQ) new Envy 13 is insanely thin -- just a hair thicker than the USB ports on its side -- and starts at $800. And its Spectre x2 laptop-tablet hybrid, also starting at $800, is like Microsoft's Surface Pro but with a sturdier laptop-like keyboard. The company said it worked very closely with Microsoft to get its lineup to be exactly what customers want in a PC. "Everything is driven by insights; we start with customer and work backwards." said Mike Nash, Hewlett-Packard's head of product strategy. "If you were in the meeting with HP and Microsoft, and you went around the room, you wouldn't know who was the HP person and who was the Microsoft person." Dell's new XPS lineup, which starts at $800, is consistently one of the best-reviewed in the PC industry. Its "InfinityEdge" display, which has virtually no bezel at all, is something to gawk at. The company's less-expensive Inspiron PCs have gotten more customizable. Starting at $230, there are Inspirons that bend all the way backwards, flip around and pull apart. Lenovo's bestselling Yoga lineup of backflipping laptops, which starts at $700, got even better for the holidays with Intel's newer, faster processors. But the real standout is the $1,200 LaVie Z. It weights less than 1.9 lbs., making it the world's lightest 13-inch laptop.